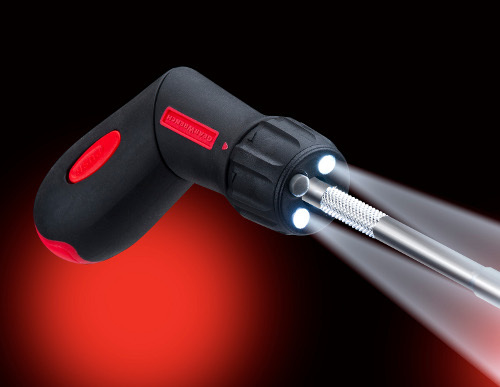 SPARKS, MD (May 13, 2013) – GearWrench®, a premier hand tool brand from Apex Tool Group, known for tools that deliver speed, strength and access, today announced the new 2-Position Ratcheting Screwdriver with LED light technology. The new screwdriver (sku # 82788) has two LED lights that help illuminate a work area, making it easier to work in poorly lit spaces. The 2-Position Ratcheting Screwdriver with LED lights has a 45-tooth ratcheting mechanism with forward, reverse and locked positions to quickly tighten or loosen fasteners. The screwdriver features a stainless steel collar that magnetizes the bit tip to help hold fasteners on the tool, resulting in fewer dropped and lost fasteners. With the 2-position handle, users can choose the position that is the most comfortable and provides the best leverage to turn the fastener. Users also benefit from 6-bit storage (Phillips #1, #2 and T15, T20, T25 and T127 included) in the handle, making bits easily and quickly accessible. The 4 ½-inch long shaft provides greater access for end users. “GearWrench continuously strives to make jobs easier for our users,” said Jim Stewart, product manager for GearWrench. “The LED lights on our latest screwdriver help technicians who work in poorly lit areas see more clearly. With this tool, they won’t have to fumble with flashlights or struggle to work on a fastener because of poor lighting conditions. This screwdriver allows users to complete jobs much faster. The 2-Position Ratcheting Screwdriver offers strength, speed and access, making it easier and quicker to complete jobs. The 2-Position Screwdriver comes with a lifetime warranty. In addition to screwdrivers, GearWrench also produces ratchets, ratcheting and non-ratcheting wrenches, sockets, screw/nut drivers, pliers and specialty tools. GearWrench is a premier hand tool brand from Apex Tool Group, one of the largest hand tool manufacturers in the world. Since the launch of the original patented five-degree ratcheting wrench, the GearWrench brand has continuously led the industry with breakthroughs in pass-thru ratchets, sockets, screw/nut drivers, pliers and specialty tools. Millions of GearWrench products have been “Professionally Tested” throughout the world. Additional information about GearWrench is available online atwww.gearwrench.com. Apex Tool Group, LLC, based in Sparks, MD, is one of the largest worldwide producers of industrial hand and power tools, tool storage, drill chucks, chain, and electronic soldering products. Directly and through its subsidiaries, Apex serves a multitude of global markets, including automotive, aerospace, electronics, energy, hardware, industrial, and consumer retail. Apex markets its portfolio of diverse products under its own brand names in addition to being the principal manufacturer for several key private label products for certain retailers for many years. Additional information about Apex Tool Group is available at www.apextoolgroup.com.